the Lord GOD . . . . 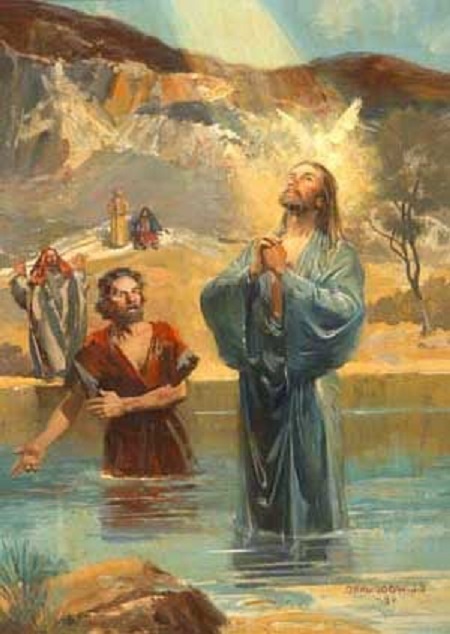 The Baptism of our Lord by St. John the Baptist was one of several instances in the Old and New Testaments — see also Genesis 1:26, John 5:7, and Matthew 28 — when the nature of the Triune Godhead is revealed as the vexing mystery of three Persons in one God. But the above narrative in Luke 3 also speaks to the importance that Jesus holds for the sacrament of Baptism. Even the Son of God was Baptized, intended for sinners, before He began His public ministry. Baptism purifies and sanctifies (makes holy) the person, making him/her a dwelling of the Holy Spirit. That means that without Baptism, a person is without the Holy Spirit and rendered defenseless against the Evil One. I was baptized when I was four, but fell away from God and from the Church when I entered college, naïvely believing in a charismatic professor named Mitchell Bedford who said the discovery of the Dead Sea Scrolls had proved Christianity was a myth. What terrible and evil deeds college professors can do. An agnostic, I wandered in the wilderness for decades until I was born again. This August 9 will be the 17th anniversary of my coming home. On that day in 2002, choking with tears streaming down my face, I made my big Confession for all my sins and He forgave me. I truly believe that, had I not been baptized all those many years ago and given the shield of protection, I would have been lost forever. So if you are a Christian, don’t make the mistake of postponing the baptism of your child(ren). Baptism — clothing your child “with Christ” — is the most important thing you can and will ever do for your child. This entry was posted in Bible, Catholic Church, Christians/Christianity, God, Inspirational, spiritual warfare and tagged Baptism of Jesus, Catechism on Baptism, Holy Trinity, Isaiah 40, Luke 3, St. John the Baptist, St. Paul on Baptism. Bookmark the permalink. Dr Eowyn . . . . What a wonderful Sunday lesson. Of all the Heavenly gifts that have been bestowed on man, the fact that we can have the Holy Spirit to dwell with us is rated at the very top. The Holy Spirit whispers to us as long as we are living lives in accordance with The Lord’s commandments. Those who choose worldly pursuits little by little lose the promptings of the Holy Spirit, and eventually they accept the promptings of Satan. Thankfully, I was baptized at birth, and later in grade school was confirmed to the faith. The years in my teens were so bad for me, that I almost fell away from god, and the church. I don’t know, it must have been Gods grace and love that pulled me back. My faith has been strong ever since.